In the international political structure, South Asia is known as the most volatile region in the world. With the worst memories of three deadly wars, with one war (1971) that led toward debacle of Bangladesh remained a prime reason of distrust among the two South Asian states India and Pakistan. Historically, in all the three major wars, conventionally Indian superiority was prominent. Pakistan always remained concerned regarding the growing disparity and asymmetry vis-à-vis India. India’s doctrinal transformation and ballistic missile defense capabilities have indulged Pakistan in efficiency of warheads. Now, India and Pakistan have an extensive, largely indigenous ballistic missile program. Missile development in the peculiar South Asian environment took its root since the mid 1980’s. In February 1988, India had tested Prithvi which was based on Russian SA-2 missiles with a range of 150km and a payload of 1000kg. After the very first year of Indian missile test, in February 1989 Pakistan following Indian foot prints announced the testing of Hatf-I and Hatf-II missiles with a range of 70-100km and a payload of 500-300kg. Like its nuclear program, Pakistan’s missile program was also Indian centric and is purely security driven. Unlike India, Pakistan has no pretensions to the status of a regional or global power. Pakistan often expressed with conviction that it’s nuclear as well as missile program is just to ensure its defence vis-à-vis neighboring India and it has no intension of using these missile for political purposes. Pakistan is located in a complex strategic environment where the presence of its inherited hostile neighbor India with the intension to become greater power in region further multiplies its challenges along with other many internal security challenges. But the thing is no one can change its history or the geography; what one can do is to address the intensity by taking countermeasures. Indian missiles tests was a wake-up call for Pakistan to which Pakistan replied timely. However, the advent of ballistic missile in South Asia with other technological advancement not only instigated a competition between India and Pakistan but also dampened the prospects of strategic restrain. To compete with Indian growing ballistic missile capability Pakistan has three tiers of ballistic missiles which includes; Battlefield Short Range Ballistic Missiles (BSRBMs), Short Range Ballistic Missiles (SRBMs) and Medium Range Ballistic Missiles (MRBMs). However, it is important to understand that Pakistan has not desired to seek nuclear parity with India. Every Pakistani move is exhibited a reaction in response to an Indian action. Pakistan’s successful test launch of Shaheen-III Surface to Surface Ballistic Missile (SSBM) on 9th March from the Southern coast off the Arabian Sea is also a reaction of India’s 19th February test-fired nuclear-capable Prithvi-II missile. Pakistan’s response shows that it has the capabilities to counter the intimidating Indian advancement. Recently, Pakistan has test-fired another ballistic missile Ghauri. Ghauri is capable of carrying both conventional and nuclear warheads up to a distance of 1,300 kilometers. 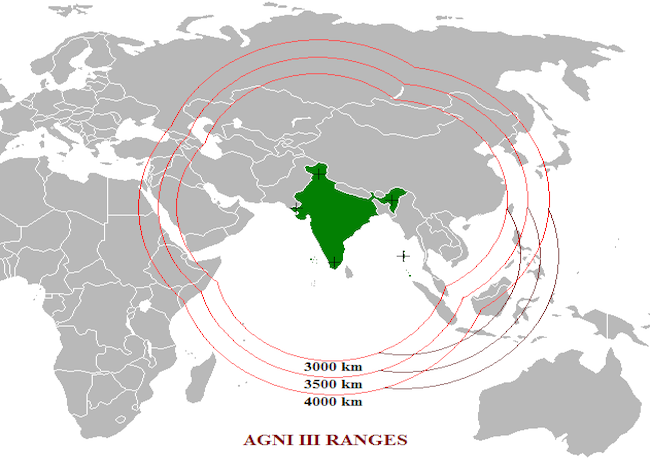 On the very next day India test fired its nuclear-capable Agni-III ballistic missile with a strike range of more than 3,000 km from Wheeler Island off Odisha coast. In South Asian action-reaction syndrome greater responsibility lies on India because what so ever Pakistan is advancing in the field of missile technology is just to ensure Pakistan’s defence and sovereignty unbreakable vis-à-vis India. India should have the realization that its revisionist behavior is not only exacerbating disparity and asymmetry also increasing instability which ultimately results unending missiles race. To avoid further missile race in South Asia it is imperative for both India and Pakistan to prepare grounds for discussions in this regard within a parallel settings. Any development like 1999 Lahore Declaration can set the required precedent. When we talk about the ballistic missile competition then surely India is the winner! Contemporary Indian development of variety of missile in range and payload capability is destabilizing the regional peace. Moreover now it has become a global concern as after the sea based and mobile launch capability it can target all the states for power.